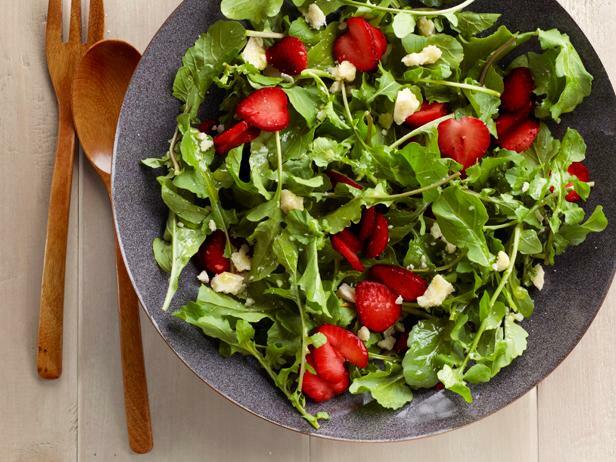 This simple strawberry and arugula salad is drizzled with a citrus vinaigrette. Toss the strawberry slices, arugula and parmesan crumbles in a large bowl. Vigorously whisk together the mustard, sugar, lime juice and orange juice in a medium bowl, whisking between additions to dissolve all the ingredients. Add the olive oil in a thin stream while whisking with the other hand. (This is a perfect time to ask for an extra hand, or place the bowl in the center of a dish towel curled into a circle around the base to stabilize it.) Taste and season with a pinch of salt, if needed, and a grind or two of pepper. Toss the salad with some of the dressing and serve the rest on the side.